I am not a fan of the Twilight series but squatting on the slopes of the bayou beneath the Montrose Waugh Bridge Road, waiting for the phantasmagoric creepy flyers was going to turn out into a 90 minute (years) wait for a soul mate. About 250,000 Mexican Free-tail bats living in the crevices throughout the Waugh Drive bridge emerge at sunset from beneath the bridge that spans Buffalo Bayou between Allen Parkway and Memorial Drive. Their emergence, to stretch their limbs and have a feast of insects, is turning into a major tourist watch as the Waugh Bridge Bat Colony is a permanent fixture. The Houston bats, unlike their peers across Texas, do not migrate to warmer climes, preferably Mexico, during winter months. The nearby Austin Bat colony of nearly 1.5 million inhabitants clears out in the Fall months. 7.45 p.m., the projected time of sunset progressed to 8.30. The minutes ticked and still no sign of the nocturnal creatures. Any small flying mammal was enthusiastically clicked, even as the strong bayou smell, more like wet fur, failed to dampen the collective Mephistopheles affectations. The sunset gave way to darkness and we waited. The lone flyers, excitement around, were probably checking the human force and mustering defenses against camera lights. Signs advice against use of flash, but then we had to capture the bat induced black out. Finally one by one the crowd slinked out, it was past dinner time, with few diehard fans still waiting. 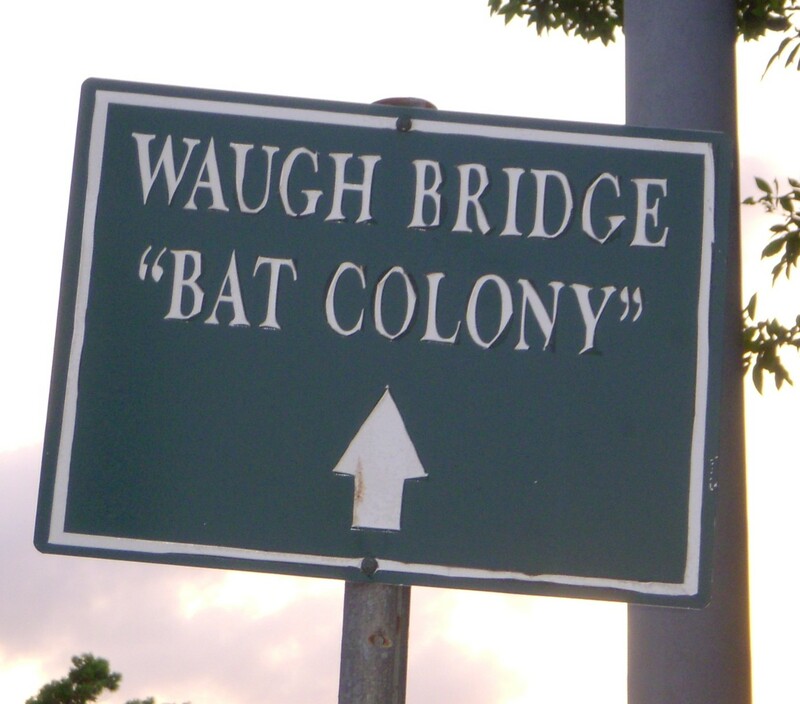 Maybe next time we could take the Waugh Bridge Bat Colony Pontoon Boat Tour or checkout the ’emergence’ time. It is easy to locate the site less than a mile from downtown Houston and across the American General tower on Allen Parkway. 1. Boat Tour Location: Downtown Houston: Sabine-to-Bagby Promenade (part of the Buffalo Bayou Promenade project).